Square footage: 1375 sq. ft. This move-in ready unit is on the third floor with elevator access. Beautiful ocean views. Vaulted ceilings in the great room and a working fireplace. Washer/dryer. Call Eileen (831)277-9939 to see this or any other condos on the Peninsula! Square footage: 1245 sq. ft. Updated, move-in ready unit with beautiful forest views and peeks of the Monterey Bay. Crown molding, open kitchen with breakfast bar and stainless steel appliances; spacious master bedroom, large walk-in closet. Minutes to a variety of golf courses and restaurants in Monterey, Pacific Grove, Carmel and Pebble Beach. Tranquil living within Pebble Beach. Beautiful views of the Del Monte Forest and peeks of the ocean. Top floor corner unit (via elevator) with expansive cathedral ceilings, gas fireplace, wet bar and crown molding. Large secluded terrace. Minutes from everything Pebble Beach, Carmel, Pacific Grove and Monterey have to offer. Completely updated move-in ready, ocean view unit in the Ocean Pines Development in the gated community of Pebble Beach near the famous 17-Mile Drive. Stunning blue water views and fabulous sunsets in the secluded hideaway. The house is completely updated with plantation shutters, stone fireplace, cherry wood floors, new stainless steel appliances and an in-house washer/dryer. 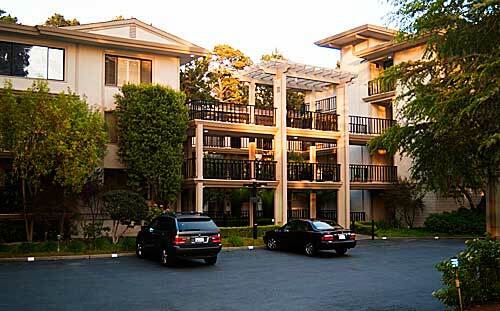 Conveniently located,m just minutes from the best of the Monterey Bay and the greens of world famous golf courses. Square footage: 1342 sq. ft. Updated ocean view first floor in the 3 3 level Sandpiper building. Beautiful ocean views and sunsets throughout the year. Updated kitchen with granite counters, full tile backsplash, 42 inch cabinets with lazy susan, pantry storage with pull-out drawers, storage closet, 5 burner gas range/oven and dishwasher. Double pane glass on all windows and glass door. Square footage: 1968 sq. ft. Spacious, renovated second floor unit conveniently located near elevator. Laundry room with storage. Split bedrooms with two bedrooms and a sitting room on one side and the master bedroom with private bath on the other. Upgraded and remodeled in 2011. This third floor unit in the Spindrift building located across from the elevator was taken to the studs and recreated with all new wiring, plumbing, flooring, drywall, cabinetry and stone work. The floor plan offers open living areas and flexibility including a charming outdoor deck.